Cambridge, Maryland-based corrugated manufacturer celebrates ‘Live United’ initiative in support of United Way’s 2010 campaign. On Friday, 29 October, Interstate Container Cambridge members celebrated their achievement of contributing $35,000 to 2010 United Way Campaign. Employees wore black ‘Live United’ shirts demonstrating the corrugated packaging manufacturer’s support of United Way. United Way board members joined in the celebration. For the past three consecutive years, Interstate Container Cambridge has held an employee campaign to raise funds for United Way. This campaign allows employees to contribute funds to the cause through payroll deductions, one-time donations, or donations billed to a credit card over a period of one year. United Way, a non-profit organization, focuses on improving the quality of life and directs efforts and donations into the three main building blocks of a good life: education, health, and income. The organization also engages in disaster recovery, including the ongoing program along the Gulf Coast since the devastating hurricanes of 2005. "I'm extremely proud of the employees and the way they've stepped up and contributed, the employees are the ones that made this happen. I'm extremely thankful for what they've done." 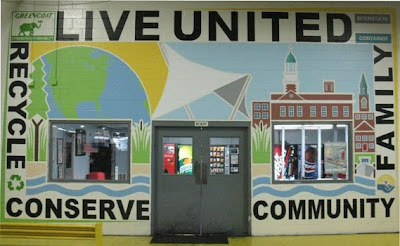 The mural, painted by Rosato, on Cambridge office premises, expressed through art Interstate Container Cambridge’s commitment to ‘Live United’. It depicted the essence of the manufacturer’s dedication to supporting the community and proactively protecting the environment through eco-friendly initiatives. Interstate Container Cambridge is a member of Interstate Resources Container Division a member of INDEVCO Group, the 'Local Multinational of the Middle East'.